After falling on stale bull selling and profit taking from $1295 - $1277 over the past two sessions, gold rebounded modestly last night in a range of $1277.50 - $1285.15. The yellow metal initially dipped to its $1277.50 low during Asian time, finding support ahead of $1277 (triple bottom– 12/28, 1/4, and 1/21 lows). This was as the US dollar strengthened (DX from 96.30 – 96.48) against a plunge in the euro, ($1.1374 - $1.1346) which softened after the IMF again downgraded global growth in 2019 from 3.7% to 3.5% - with the forecast for Germany cut significantly. 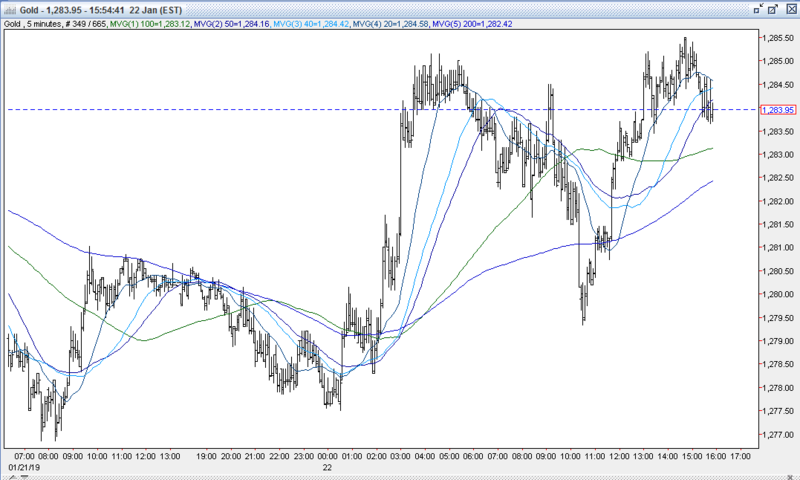 Gold rebounded to its $1285.15 during European time, however, as the DX retreated to 96.31. It was pressured by strength in the pound ($1.2856 - $1.2927, strong UK Labor data, decreasing likelihood of a no-deal Brexit) and a recovery in the euro ($1.1367, better German ZEW Survey). Gold was also lifted by weakness in global equities, which were hurt by the IMF downgrade on top of weaker Chinese growth announced the night before (6.4% - lowest in 30 years). The NIKKEI was down 0.5%, the SCI fell 1.2%, European shares were off 0.6% to 0.7%, and S&P futures were -0.8%. A dip in oil prices (WTI from $54.51 - $52.90) on concerns of a slowdown in China hurting demand prospects weighed on stocks. Ahead of the NY open, gold drifted down to $1282 against a bounce in S&P futures (2649 – 2657), and the DX clawing back to 96.42. US stocks opened weaker (S&P -28 to 2642), hurt by a miss in US Existing Home Sales (4.99M vs. exp. 5.24M), and with losses in the Energy, Industrials, and Materials sectors weighing. The US 10-year bond yield declined to 2.743%, but the DX failed to decline. It was pushed higher by a drop in the euro to $1.1335 – 3 week low. 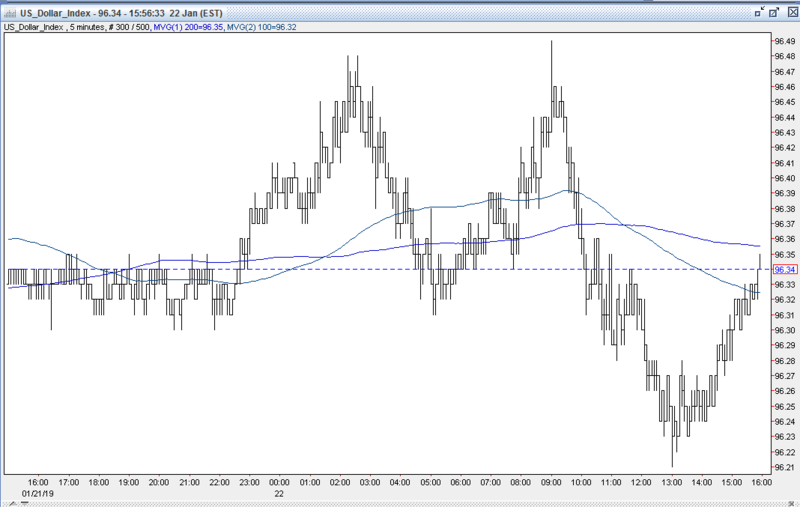 Gold worked lower in response, retracing back to $1279. Toward mid-day, US stocks continued to soften (S&P-46 to 2623) - hurt by news that the US turned down China’s offer of preparatory trade talks this week, trying to get the Chinese to sweeten their offer. A further drop in oil (WTI to $52.02) also contributed to the decline. The 10-year yield dipped to 2.739% and the dollar weakened, with the DX taking out its overnight low to reach 96.24 – on further strength in sterling ($1.2971) and a recovery in the euro ($1.1368). 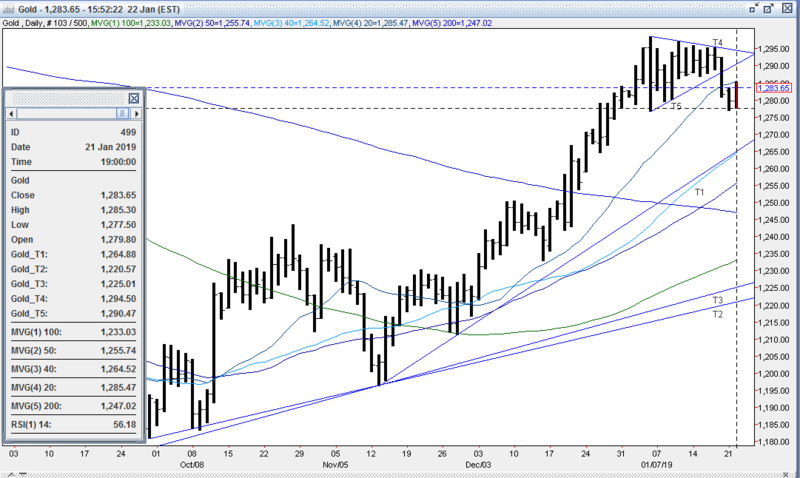 Gold rebounded and traded up to $1284.75, where resistance at the overnight high held. In the afternoon, US stocks weakened further (S&P -53 to 2617), while the 10-year yield did same – to 2.727%. The DX ticked down to 96.22, and gold managed to take out its overnight high to reach $1285.50, but resistance at the old $1286-88 support level held. Later in the afternoon, US stocks rebounded (S&P finished -37 to 2633), helped by comments from Larry Kudlow denying any meetings with China were canceled, and highly touting the negotiations’ progress. The 10-year yield recovered to 2.745% and the DX climbed back to 96.37. Gold pulled back to $1283.50 response and was $1284 bid at 4pm with a gain of $5. Open interest was off 1.7k contracts, showing a net of new longs from Friday’s decline. Volume was higher with 263k contracts trading. Bulls were disappointed that gold failed to take out the stiff resistance at $1295-98 from last week, and the ensuing pullback from stale bull selling that breached the bottom trendline from the pennant formation at $1288 – which had been solid support (6 bottoms – 1/10, 1/11, 1/14, 1/15, 1/16, and 1/17 lows). However, other bulls remain encouraged with today’s bounce to reach $1285, despite the DX remaining above 96. Bulls feel that the trend is their friend, and note the up trendline from the 11/13 $1196 low is still intact. They expect the yellow metal’s strong rally over the past two months to carry further. They’re expecting continued volatility in equity markets along with a pause in Fed rate hikes and a further decline in the US dollar to continue driving gold higher. While we haven’t seen the COT report in 4 weeks, bulls maintain that despite gold’s sharp rally, a significant amount of large fund shorts still remain, and will provide further upside momentum when forced to cover. Bulls expect a retest of initial resistance at the old support level of $1286-88, followed by a retest of the stubborn level$1295-98 (8 tops –1/3, 1/4, 1/10, 1/11, 1/14, 1/15, 1/16, and 1/17 highs). Bears felt gold’s rally to $1198 was overdone, and were pleased with the pullback to $1277. They also feel the 20% correction in equities – much of which occurred during very illiquid holiday trading – was also overdone, and expect the rebound seen over the past month to continue. Bears feel that the plunge in the US dollar seen since 12/14 (97.71 – 95.03, 2.74%) has also overshot, and look for the rebound in the greenback to carry forward. Bears will look for a breach of initial support at $1277 (quadruple bottom – 12/28, 1/4, 1/21, and 1/22 low) followed by $1265-67 (12/25, 12/26 ,and 12/27 lows, and up trendline from 11/13 $1196 low. They expect a move to at least $1247 – the 50% retracement of its up move from the 11/13 $1196 low, and the 200-day moving average. All markets will continue to focus on geopolitical events (especially Brexit developments), developments with the Trump Administration (especially on US-China trade, potential legal issues), news out of Davos, oil prices, Q4 corporate earnings, and will turn to reports tomorrow on Japan’s Trade Balance and BOJ rate decision, US MBA Mortgage Applications, House Price Index, and Richmond Fed Manufacturing Index for near term direction. However, the release of many US reports are subject to the ongoing government shutdown.